Despite the poor visibility, defenders of the fort still take aim. Each musket must have more powder poured and packed from the muzzle of the gun between each shot. Skilled soldiers could fire up to three times a minute at this point in history. 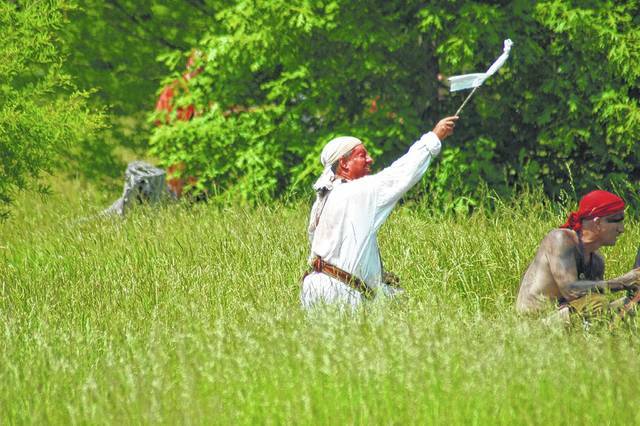 To end the siege, the Natives waived a white flag in surrender. 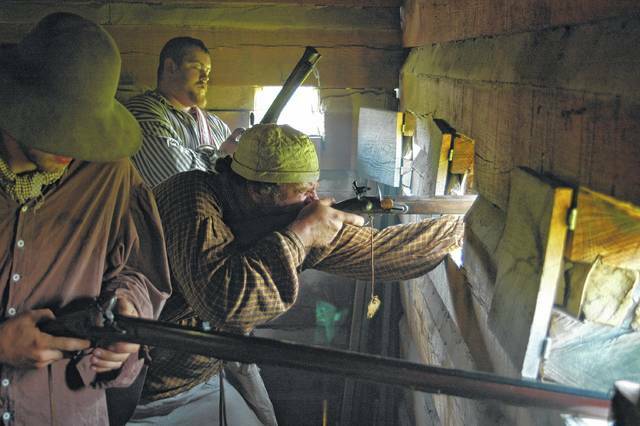 POINT PLEASANT — The 19th annual Siege of Fort Randolph encampment and re-enactment returns this weekend to Krodel Park, with events planned May 18-20. The event will have demonstrations about frontier life skills in the Fort and nearby Indian Village, with the highlight being a portrayal of the outdoor drama on Saturday. Denny Bellamy, Mason County Tourism Director, explained the outdoor drama portrays the historical death of Cornstalk which took place after the Battle of Point Pleasant. Bellamy commented this is one of first big re-enactments of the season for the re-enactors. He said the outdoor drama goes in and out of the fort, spectators move with the action. Bellamy commented this is an, “outstanding drama,” making the the whole event a nice day out with the family. The re-enactors gather at the fort in authentic clothing with real props, and live in the same way frontiersman did in the 1700’s. Bellamy commented the re-enactors stay in character all day long. Refreshments will be available, reflecting the time period. The food is free with a donation and drinks have a small charge. A complete itinerary for this weekend’s events regarding the siege is as follows: Friday, May 18, school tours, 9 a.m. – 2 p.m., gates close at 5 p.m. that day. Saturday, May 19, demonstrations from 9 a.m. – noon, trade blanket shopping, 9 a.m. to 11 a.m., flag raising ceremony, 10 a.m., magistrate court, 12:30 p.m., “The Siege of Fort Randolph: The Death of Cornstalk,” outdoor drama, 2 p.m., running of the gauntlet at the Indian Village, 3 p.m., auction, 4 p.m., gates close at 5 p.m.; Sunday, May 20, gates open at 9 a.m., church services, 10 a.m., gates close at 2 p.m. The gift shop will be open this weekend. Cost of admission is $3, children six and under are free. Erin Perkins is staff writer for Ohio Valley Publishing. Reach her at (304) 675-1333, extension 1992.